His Italian grandmother used to call him “Doo-glass” with her thick accent. There is only one person who can mimic this properly, and it is Doug himself. When he says it, I can’t help but smile and be magically transformed into a 17-year-old again, giggling at all the terribly dirty, dirty sayings that my friend Doug taught me and that I still repeat to this day. Sayings I have no intention of forgetting and not using. Doug is one of my oldest friends. Scratch that: he’s my oldest friend, singular. I’ve been trying to remember how we met exactly. Was it in a class? At an event? After over 20 years, it doesn’t matter anymore, not really. What matters is that Doug and I have stayed in touch through all my moves to Wyoming, to Italy, to Seattle; his up and down moves through California. He used to love soccer and followed the San Jose team around for a long time. When the team first started up, he designed their team logo as a trade so he could go free to the games. 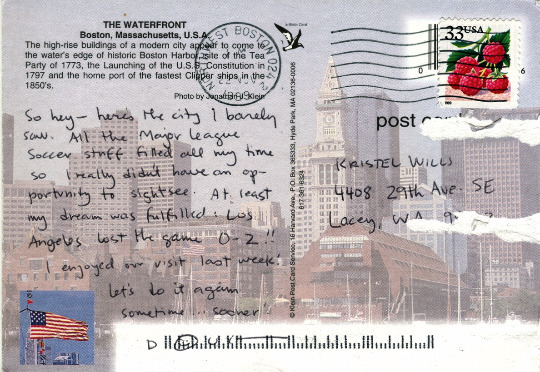 This postcard comes from those days when soccer was his passion. He told me recently that when he realized he didn’t have any passions anymore, he decided to take up gardening and cooking. He wants to master sauces and flambés. I love this image of my friend Doug: sautéing homegrown tomatoes and lighting something on fire, cool as a cucumber, just as he’s always been. The high-rise buildings of a modern city appear to come to the water’s edge of historic Boston Harbor, site of the Tea Party of 1773, the Launching of the U.S.S. Constitution in 1797 and the home port of the fastest Clipper ships in the 1850’s. 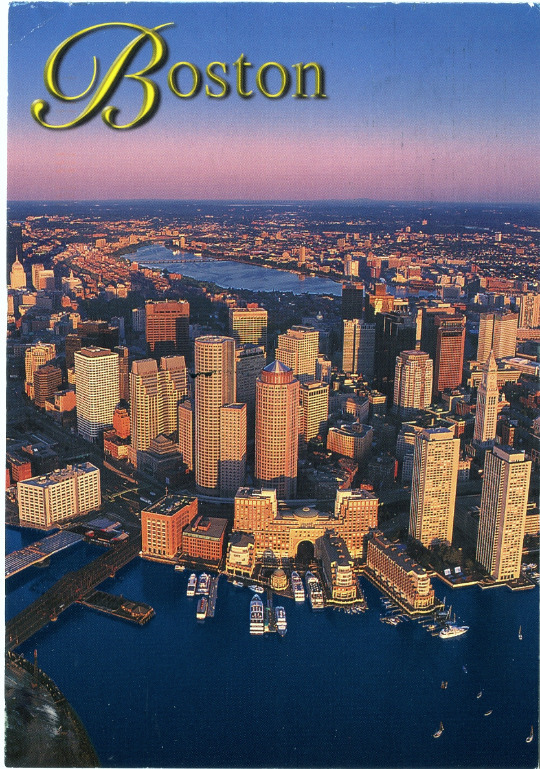 **Did you note how Boston is apparently long past its heyday?